A comedy interlude for every performer! Ring Gimmick PLUS DVD EXPLANATION! 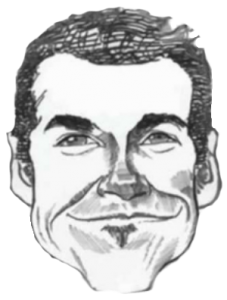 Looking to add more shtick and comedy to your act? Do you perform Ring Flite? Then, you’ve gotta have Robert Baxt’s Ring Flite Gag! The Ring Flite Gag is a wonderful addition to any ring trick you already do. Besides being a powerful piece of funny business, it also allows you to climax your favorite ring routine with a stunning reappearance in a previously seen location! When doing walk around magic at a party, your spectators may leave in the middle of a card trick to get up and dance if their favorite song comes on. They will interrupt your coin tricks to talk to their favorite friend when they walk into the room. But nobody budges when you’ve got your hands on their valuable ring! This prop allows you to expand your regular ring routine and add an extra punch to your existing routine or to use it on its own! Borrow a ring from your spectator and while casually examining it remark, “Could I interest you in a trade-in?” You then display an array of rings safety pinned to the inside of your jacket. This alone gets HUGE laughs. 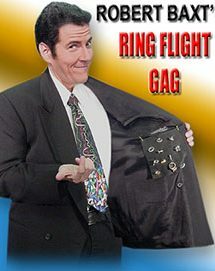 You could go into your favorite Ring Flite routine at this point and end it miraculously, or you could proceed to the killer finish Robert has provided you: at the end of the gag/routine, the borrowed ring vanishes AGAIN, only to reappear safety pinned along with all the other rings on the inside of your coat your spectators clearly saw earlier! This is a very entertaining routine because of the comedy and multiple vanishes and reappearances of the ring included with the routine that Robert shows. This is the original — accept no substitutes and support its true creator! You receive Robert’s very own custom-made gimmick. (Devilishly smart indeed and it’s NOT a reel or magnet!) It fits easily inside your coat and takes up no space in your pockets!Comes complete with a piece of fabric that has many toy rings pinned to it, plus the secret “something” built into it that lets you do this illusion. INCLUDES A GENUINE JEWELER’S EYE LOUPE PLUS A DVD OF ROBERT’S FULL ROUTINE WITH GAGS, BITS OF BUSINESS, JOKES, EXPLANATIONS, AND IDEAS FOR CUSTOMIZING THE PRESENTATION! Price $79.95, with FREE! shipping and handling INSIDE the United States included.